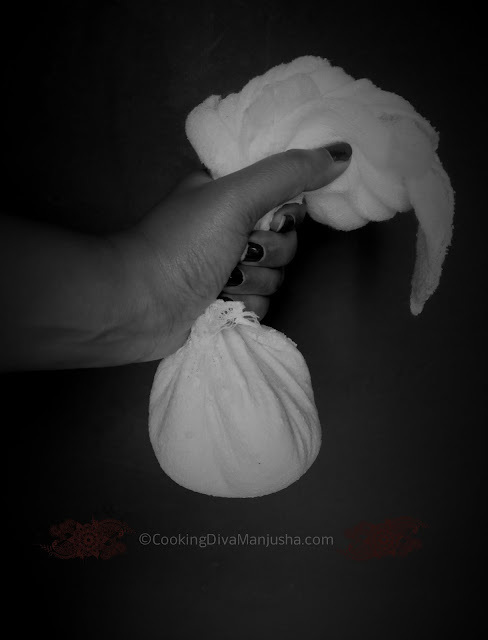 I also remember how amma darling would heat the raw milk we just got from the milkman; to pasteurize it naturally before using it for anything.Those days I never saw her buying any milk packets as such .So,guess what, after landing in US, this mere milk really challenged not only my culinary knowledge but also my common sense . I still dared to give this tea to my better 1/2 BUT with a warning that it tastes something from a extra terrestrial world though. 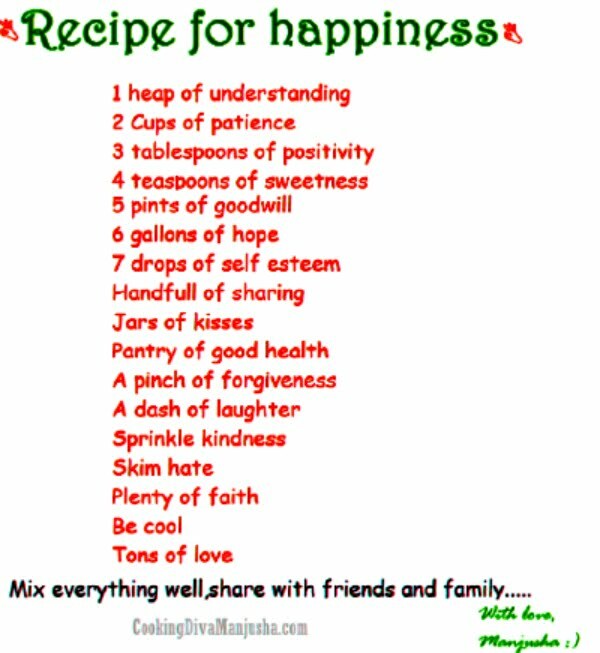 He replied,"Well honey,the milk has gone bad..did you check the milk carton-the expiry date ? " . Though I smirked back saying,"Aaah expiry date...I th..thought so !" and he was like ..great that means no tea today ..now that's a good morning indeed !! Thanks baby -made my day!" ...I gave him a pep lecture about how healthy a cup of black tea can be ...which of course didn't work !! It continued for a while ,I confess with a heavy heart,that I used to even throw milk when it went bad not once but many times.Since wasting food is not something I or my family prefers,that forced me to research on this milk and milk cartons here ; I mentally noted the basics but I do forget couple of points so thought of noting it here and sharing it with others too. Sell by date - Usually ,one should keep an eye on the sell by date on the milk carton which indicates the final date, a store can legally sell the milk and a consumer can usually enjoy it. Some states have a best used /use by date that indicates the date ,the milk is believed to be at peak flavor. After that it may be edible but the taste may be deteriorating. Expiry date - By this date,the milk should be tossed for good. A milk can go bad even before the sell by date or its expiry date.It also depends upon how milk was stored,handled before you purchase from the store and also how soon and apt was it stored at home later.The milk should always be maintained cold and covered otherwise the warm temperature or any exposure near heat or light can make the spoilage bacterias active ,shortening the shelf life of the milk thereby. According to the "Center for Disease Control and Prevention",if you experience a power outage in your area ,then ,if it lasts less than 4 hours then the food in your refrigerator/freezer should be safe to consume.Keep the refrigerator doors closed as much as possible .Otherwise ,put them in a cooler with ice or cold water if possible. Well,that's how I learned a way to reuse my milk past it's sell by date by turning it into paneer after considering those points mentioned above . 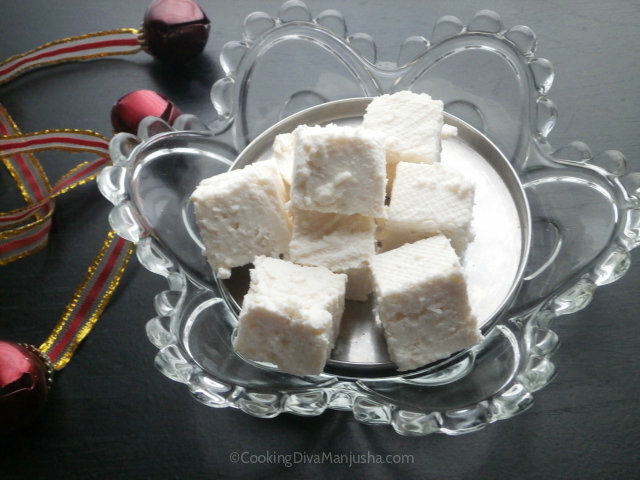 Paneer is a very popular Indian cheese all over the world .If you have not , please click here to see how to make Paneer with fresh milk at home . 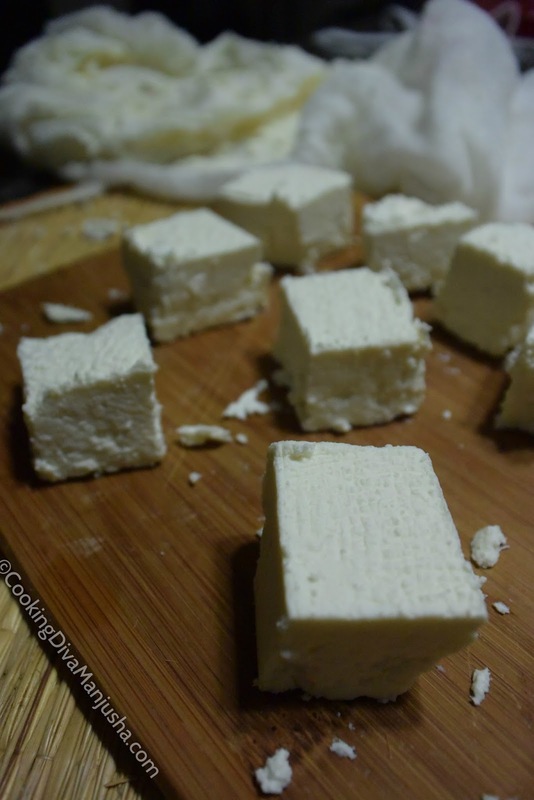 This paneer is made using 1/2 gallon / 2 liter milk ,approx (whole fat ). 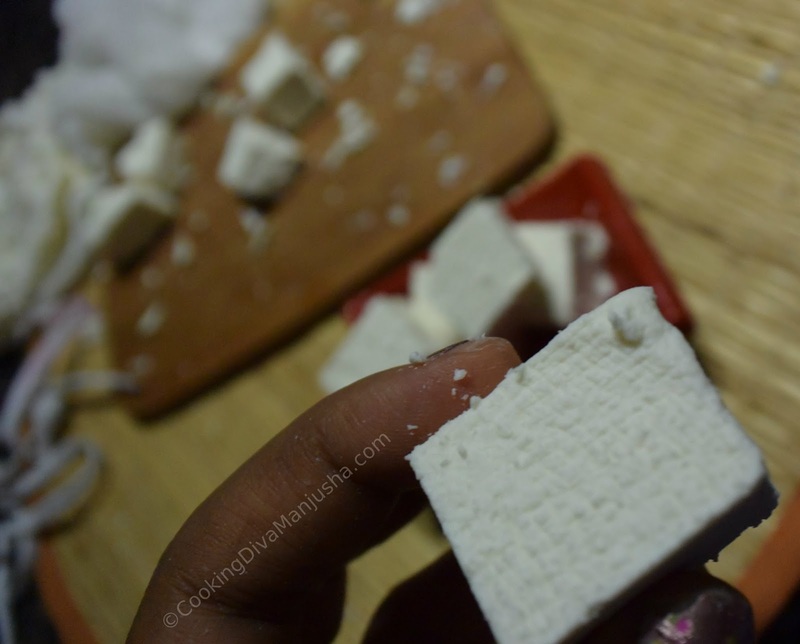 (Makes about 2 cups of paneer cubes).Paneer should always be made with whole fat milk to get tasty ones . 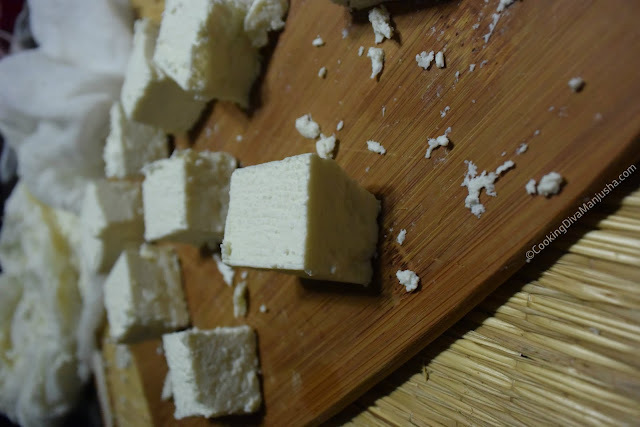 These Paneers may not taste as good as paneer made out of fresh milk.It will be very fragile comparatively. .DISCLAIMER - Spoiled milk should be used carefully though and it's affects may vary from person to person especially the kids,old people,pregnant women and those with low immunity must be very careful as it may cause them some kind of food poisoning. So,that's how I not only learned how I can keep the milk bought fresh and longer but also not to throw it with a huge guilt as much as possible and also how to use it safely even after it's sell by date by turning it into something more edible,delish and I believe ,since we are reheating the milk for making paneer here,that kinda pasteurizes further and makes it more safer to eat !! Now ,I "don't cry over the spilled milk" anymore !